If you are even slightly interested in fitness, you may have heard people discussing macros lately. The “if it fits your macros” diet is rapidly gaining popularity since it is flexible and easy to follow. Even if you do not want to lose weight, macros are a very important part of living a healthy lifestyle. Macros are an essential part of food nutrition because they help to maintain the human body. Keep reading to learn everything you need to know about macros. What Is the Definition of Macros? The word “macros” is the abbreviated form of macronutrients. According to the Cambridge Journal of Public Health Nutrition, macronutrients are any type of chemical compound that humans must eat in large quantities for energy. Macronutrients are primarily responsible for producing the energy that the human body uses to move, pump blood, build new cells, breathe, and much more. All macronutrients can be divided into three main categories: carbohydrates, proteins, and fats. Carbohydrates are compounds made from carbon, hydrogen, and oxygen. Common examples of carbohydrates include sugar, wheat, potatoes, and corn. Generally, carbohydrates are starchy or sugary foods. Data from the USDA shows that 50 percent of all foods eaten are carbohydrates. Proteins are long chains of amino acids that are folded into unique three dimensional structures. Most protein macros come from animal products like beef, poultry, eggs, and milk. However, smaller amounts of protein can be found in plant based sources like beans, nuts, and seeds. Fats are the third macro, and they are formed from fatty acids and glycerides. Fats can be found from both animal sources, like butter, fatty beef, or fatty fish, and animal sources, like olive oil or peanut butter. Though certain other compounds like water are consumed in large portions, they are generally not considered to be macronutrients because they do not provide nutrition. Of course you still need to drink water, but it does not need to be calculated like macros do. Each category of macronutrients has a different function in the body. All three macros work together to support a healthy lifestyle. Learning what macros do will help you figure out which macros are most essential for your unique fitness goals. Carbohydrates are broken down into glucose which gives the other cells in the body energy to live. The only macronutrient that is not absolutely essential for survival is carbohydrates, but not getting enough carbohydrates makes you tired and sluggish. Technically fiber falls into the carbohydrates macro category. However, this unique carb cannot be digested into sugar. Instead, it helps to aid digestion by pushing food through the gastrointestinal system. Fiber is essential for digestive health, but it does not provide nutrition to the body. Proteins are primarily used to provide the building materials for new cells and store genetic information. They are especially useful if you are trying to build new muscle. If the body is not getting enough glucose for energy from carbohydrate intake, it will start converting amino acids into glucose and ketones for fuel. Fats provide even more energy than fats or proteins when burned by the body, so they are often stored as a form of ready energy for emergencies. They are also used to build certain steroids and hormones that regulate processes throughout the body, so fats are extremely important. How Can You Calculate Macro Amounts? Now that you know the importance of getting the right types of macros, it is time to take a look at your diet and actually see what macros you are eating each day. Fortunately, finding the macros for most foods is very simple thanks to nutritional labels. Look on the back of any packaged food item to find the “Nutrition Facts” chart. It will list the amount of Total Fat, Total Carbohydrate, and Protein in a serving size of food. These measurements will be in grams. You will then need to do a little math if you are trying to maintain a certain macro ratio. Each macro category is associated with a certain number of calories. One gram of protein or carbohydrates contains four calories. One gram of fat contains nine calories. Therefore, if a slice of bread has 15 grams of carbohydrates, then you would be getting 60 calories worth of carbohydrates from eating it. It is worth noting that fiber is a somewhat unique type of carbohydrate macro because the body cannot break fiber down into sugar. Therefore, some people do not count fiber when they are calculating the carbs in a food. They subtract the amount of fiber in grams from the total carbohydrates before calculating macros. Normally, you can check the back of a label for nutritional data, but this will not work for produce or cuts of meat. You will need to look up nutritional facts for the macros in fruits and vegetables online. The USDA provides a very valuable food composition database for people who need macronutrient information. 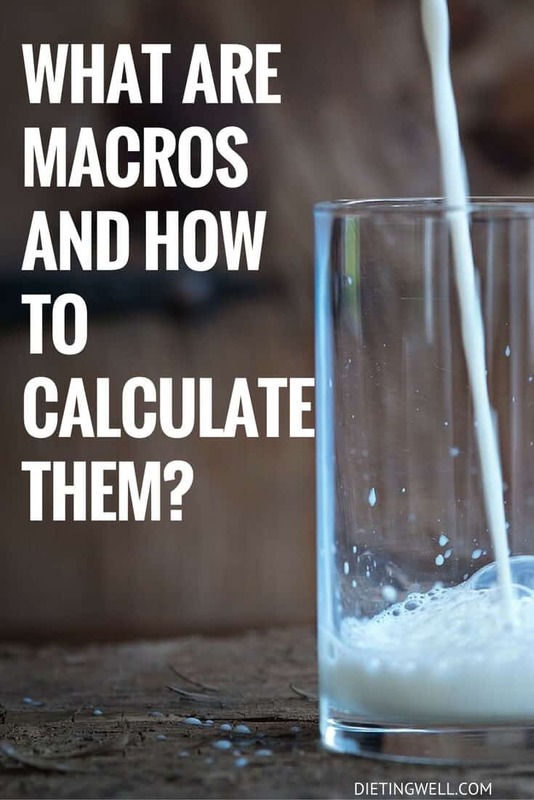 It is always important to measure your food accurately when calculating macros. If possible, use an accurate kitchen scale to weigh food. This will help you figure out how many serving sizes of an item you are eating. You may be surprised to realize how inaccurate guessing a serving size is. Modern advancements make it even easier to calculate your macros. There are many useful phone apps and websites, such as MyFitnessPal or Fitocracy Macros, that track macros. You can input your food intake, and the website will automatically use its database to find the macro amount for you. This can be a very useful tool for tracking macros. What Are the Best Macro Goals for You? Once you know how to calculate macros, you can start trying to make sure that you consume the correct amount of macros each day. To do this, you can calculate your daily caloric requirements. Once you know how many calories you eat, you can try to ensure that a certain percentage of those calories comes from a certain macro group. Generally, you want a high amount of protein if you are trying to build muscle. You will need a high amount of carbohydrates if you are exercising regularly because they provide fuel. If you are trying to lose weight though, carbs may need to be avoided because they are typically found in fattening processed foods. The basic formula for calculating your macro goals is the same regardless of size and fitness goals. Calculate your Total Daily Energy Expenditure to find the total amount of calories you burn in a day. Multiply your calorie amount times the desired macro percentage and then divide by 100. For example, if you burn 2,000 calories daily and want 50 percent of your calories to be carbohydrates, then you would calculate 2,000 times 50 divided by 100. That would show that you would need to aim for consuming 1,000 calories worth of carbohydrates each day to reach your macro goals. Finding a good macronutrient ratio can be difficult, because your macro goals will vary based on your fitness goals and unique body composition. You may need to slightly tweak your personal macro targets if you are not reaching your fitness goals with an advised ratio. Here are a few of the most frequently advised macro ratios for common fitness goals. When trying to lose weight, many people find it easier to go with a high protein, low fat, and low carbohydrate ratio. The lower fat ratio prevents excessive calories, the protein fuels workouts, and the low carbohydrate ratio helps people to stay away from processed junk food. Try to use about 35 percent carbohydrates, 50 percent protein, and 15 percent fat. If you just want to keep your body shape the same, a balanced macronutrient ratio is important. During maintenance, you can typically increase your fat and carbohydrate intake a little if desired. An easily followed ratio for weight maintenance is 20 percent fat, 45 percent carbs, and 35 percent protein. If your main goal is to gain weight by building larger muscles, then you will want an increased amount of protein. However, gaining muscle will require you to increase your carbohydrates and fat in order to fuel your workouts. Attempt to aim for a ratio around 40 percent carbohydrates, 35 percent protein, and 25 percent fat. Keep in mind that these ratio calculations are just guidelines. You may end up needing to tweak them a little bit to find something that works for you. Some people process certain macros more efficiently than others, so you may need slightly more carbs or proteins than recommended. Finding the right macro guidelines will make it easier to eat healthy and find a diet that works for you. A good balance will provide enough energy for you throughout the day without making you feel bloated or sluggish. When your body is properly fueled, you will be able to function more efficiently. Thanks for this article. I have been wanting to lose weight and made efforts. One drawback I experienced with keto diet was serious itching each time I am in ketosis, and increase in fasting blood sugar. I am not a known diabetic. I have decided to leave ketogenic diet and just go on low carb. What do you suggest?